As well as providing you with the latest elearning news and updates, theelearningsite.com can also offer you a range of NEW services. The owner of theelearningsite.com has a range of skills that maybe of use to some of our readings.cStu Gradwell has years of experience in graphic design, website design and marketing. Here at theelearningsite.com we are pleased to launch our NEW FORUM. If your a regular user of our site, please sign up and start a discussion. This is a new item on our site and it will develop, spread the word! Start threads, create a discussion and start communicating with like minded elearners! WE ARE LOOKING FOR MODERATORS. PLEASE CONTACT US. Institutions in the U.S., Rwanda, France and many other countries are partnering with MOOCs and elearning platforms in order to fulfill their mission to provide education to the masses. Now, Khan Academy prepares a new set of “state-of-the-art, interactive learning tools” to help students prepare for the SAT exam. They are partnering with the College Board and are actually going to help them redesign the exam. The SAT, according to Wikipedia, is a standardized test for most college admissions in the United States. The SAT is owned, published, and developed by the College Board, a private, nonprofit organization in the United States. More information is available on the Khan Academy site. In other news, Cornell Report Notes Promise of Distance Learning but Cautions Against Overtaxing Faculty. Said report is available here and is worth a read if you are an academic involved in MOOCs. Perceived Education Value: many positions in most fields require good communication skills. For this reason only, Introduction to Public Speaking seems to provide an excellent opportunity for learning skills useful in all kinds of situations. Teachers or salesmen, for example, need to master public speaking. Do you need more ideas of courses to follow? Check our MOOC dictionary, updated weekly. 2010: iPad is launched by Steve Jobs. Life will never be the same. • 2015: tablets will account for 23 percent of the global personal computer market. Tablet ownership among college students and college-bound high school seniors has more than tripled from a year ago. 35: percentage of college students owning both a tablet and an e-book reader. 6 in 10: college students say tablets help them study more efficiently — and better in class. 63%: Of College students believe tablets will replace textbooks within the next 5 years. 83: percentage of students think tablets encourage them to buy digital textbooks instead of print textbooks. 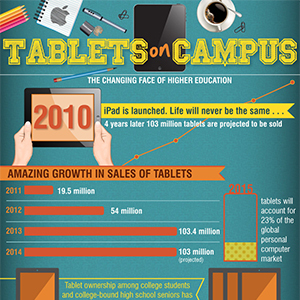 8 in 10: college students say tablets make learning more fun. 7 in 10: Have read digital textbooks. One year ago, it was 6 in 10. 23 percent occur on smartphones. The Brazilian government bought 500,000 tablets for local teachers. • Driving Games and Super Monkey Ball are awesome on it! • it’s nice to play with. • The iPad Air is lighter and faster than the iPad 2, with a better screen to boot. Twitter chats are probably the aspect of Twitter that I find to be the most interesting and most useful. I follow a lot of different people on Twitter for a lot of different reasons (I can easily find out what’s going on in town, what cool restaurants are opening, if my favorite online shop is having a sale, etc), Twitter chats give you the chance to focus on a specific topic with a like-minded group of people. Especially for professional development, this can be immensely helpful. You can connect with other educators around the globe who are doing what you’re doing. You can learn from their mistakes, share your experiences, get advice, and quite generally, learn from everyone around you. There are about a gazillion educational Twitter chats that happen regularly, but we thought we’d give you some information on a few of the big ones. You can participate whether you’re a Twitter pro or a Twitter novice, all you need to do is follow along and add to the conversation with the appropriate hashtag. Many of the chats virtually meet at a certain day and time, where users agree to chat about a particular topic at that time. Don’t worry if you can’t make it, though, because the Tweets will still be there later for you to read by searching that hashtag. Many of the hashtags used for these chats are also added to Tweets written at any time that add to that conversation, so make sure to check in on your favorite discussions regularly! via 5 Great #EdTech Twitter Chats – Edudemic – Edudemic. Jaime Wood and Kevilina Burbank, both veteran teachers from Portland, Oregon, have created a crowdfunding platform specifically for educators. IncitED launched in April as an online space to help teachers raise funds to put their good ideas to work. Why not just use Kickstarter? After all, the platform has raised more than $600 million since its launch in 2009. Some educators have run successful Kickstarter campaigns. Emily Pilloton, for instance, raised more than $16,000 on Kickstarter to help her students design and build their own classroom out of shipping containers at Realm Charter School (3) in Oakland, California. But Kickstarter is selective about the projects it accepts. Wood and Burbank worry that some worthy education projects would be turned down by Kickstarter. Read more: Educators: How to Give Your Great Ideas Wings (and Cash) | Edutopia.